Look at the adorable puppies. See them frolic and play. Let them distract you from the fact I haven't posted anything in nearly a week, and this post contains barely anything you can call "content." Just stare at the puppies, and smile. Alright, for those of you not hypnotized by such a simple trick, it is completely obvious that my old ambition of posting 5 times a week has slowed a bit, and in the last week, come to a complete halt. The reason for this stalling is simple: I'm going to Florida for a week starting Saturday and I'm currently doing about 3 weeks of work in 3 or 4 days to make sure I'm ready. Combined with the fact that my work load is increasing in general, and blog posts just have not been a primary concern. A boy's gotta eat and buy ridiculous amounts of CDs, and my writing, unfortunately, does not provide at the moment. However, I have my new camera, and new little camera for Nicole, and lots of exploring to do in Florida, so I'm sure I'll have tons of pictures to display. Plus, I've been on a music binge not seen since College, thus I'll be purging all my thoughts on said music soon, too. 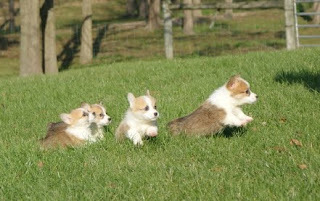 Until then, just enjoy the puppies for now. If you can't smile looking at those little rolly polly creatures, you have no place reading this blog.